Bangkok (Thailand) – January 24, 2018 (travelindex) – Rembrandt Hotel Bangkok, 25 years of the pride, together with Chef Vittario Masterchef of Da Vinci Restaurant, are delighted to invite all food lovers to experience the precious world of Moroccan culinary in “Couscous Friday” started on19 January 2018. The Moroccan cuisine is an unique and precious essence of Morocco, the country where the rich cultures from many empires combined their magic as bringing it an exotic sense of culinary; Arabian exotic spices, European excellent livestocks, Mediteranean fresh fruits and vegetables and the best Couscous that the world impressed. 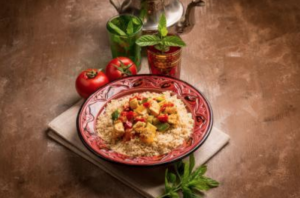 Experience new marvelously rich cultures as Chef Vittario, the master chef of Da Vinci Restaurant, has his proud Moroccan roots and is thrilled to charm you with his special Moroccan delicacy and special Couscous recipes. The Rembrandt Hotel is centrally located in the heart of Bangkok off Sukhumvit Road. Guests may access our hotel either from Sukhumvit Soi 18 or Sukhumvit Soi 20 as our property extends the length of the block. We offer luxury, outstanding services, and facilities for all travellers to Bangkok, Thailand. The property is conveniently located near the central business district as well as shopping attractions, city landmarks and vibrant nightlife. Our guests also have the benefit of all major public transportation stations in Bangkok as both skytrain (BTS Asoke Station)and metro (MRT Sukhumvit Station) are just a short 5-minute walk from the hotel or guests may ride on a complimentary 24-hour ‘tuk tuk’ shuttle service to the main road. This quality hotel is a great location for both tourists and business travellers, who will find easy access to Sukhumvit and the Bangkok CBD.